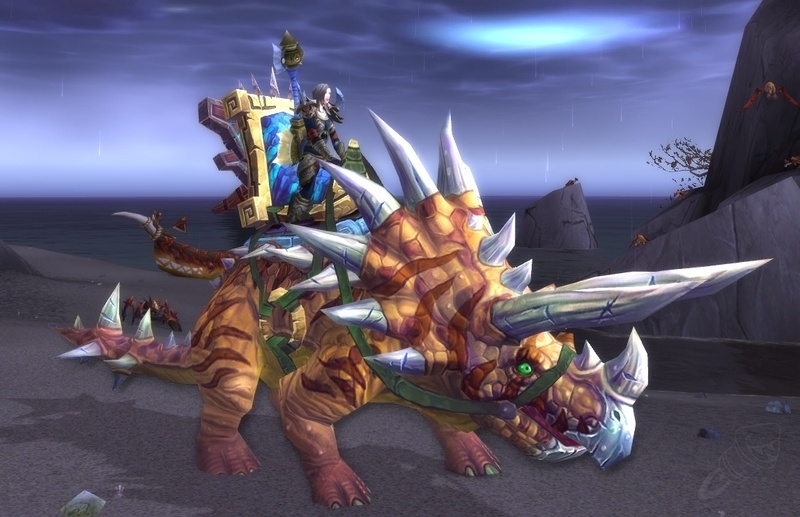 Everything important in the item tooltip, this mount is available upon reaching Exalted reputation with 선리버 돌격대, it is nice to have a triceratops mount available via rep just in case you have no luck with drops. Note that with this requiring 선리버 돌격대 at exalted, this mount will very likely be Horde Only. The Alliance counterpart to this mount is here: 황금빛 원시 공포뿔 고삐. By looking at this picture http://wow.zamimg.com/uploads/screenshots/normal/350120.jpg (its not virus, i promise :D), this mount is very big when rided by a human. Wonder how big it will be with 스마이트 씨의 놋쇠 나침반 + 브리쿨 뿔잔 up! Why? Because It's Red! :D 왜? 붉은색이니까! A great place to farm 역사적 가치가 있는 너덜너덜한 양피지 for 선리버 돌격대 reputation is through the Rogue order hall (Legion content, accessible through the Broken Isles at level 98+). The order hall is unlocked upon retrieval of the Artifact weapon. There is a man within your order hall called 윈스톤 울페, very quickly you can upgrade the Hall through him to 금고 입장권. Sending off missions per day on the Order hall table gives you a random chance to obtain 금고 입장권 as an extra reward. Handing in this quest can give you 레이 션 궁전으로 통하는 문의 열쇠 hanging on the wall in the room. Queueing for 천둥왕의 성채 from 타오스 will provide you with 역사적 가치가 있는 너덜너덜한 양피지. These can be turned in with the 선리버 돌격대 for 상급 선리버 돌격대 휘장 and 선리버 돌격대 휘장 . Remember to get the 활활! Darkmoon Faire buff before using. "블러드 엘프들이라면 당연히 붉은색을 고르겠죠."